Have you been thinking of starting an online course? Why wouldn’t you?! Who wouldn’t want to create something ONCE that they can sell again and again? BUT, before you get too excited and jump right into creating your course, there are some things you need to know. While almost anyone can create an online course, not everyone can create a SUCCESSFUL online course. 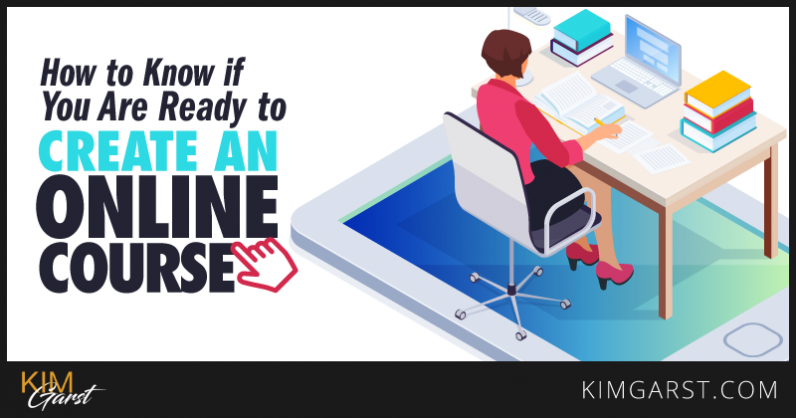 This post will help you figure out whether YOU’RE ready to create an online course. Work through the list below and see how many of these criteria you meet; the more you meet, the more prepared you are to create your own course! This isn’t absolutely necessary, but it will make selling your course SO much easier if you do! If you already have a large email list or social media following, or a loyal group of blog subscribers, you’re a step (or three!) ahead of many course creators. Not only will having an existing audience make it easier to sell your course, it will also ensure you really understand what your target market is looking for – so you can create a course that’s exactly up their alley. If you already regularly interact with your target market through your blog, email list or social media, you probably have a good understanding of their biggest pain points. So, instead of creating a course that no one ends up caring about (i.e. buying), you’re in a great position to know exactly which topics they’re eager to learn more about…and which they aren’t. Scour your emails, blog and social media comments to look for common issues, concerns and questions. You can also create a survey using SurveyMonkey or Google Forms, and ask your audience what their biggest problems are. There’s nothing like going right to the source! For more tips on finding the perfect topic for your course, check out my post How to Come up with BIG Ideas to Create Super Awesome Content Every Single Time. I’ve heard it said that you only need to be one step ahead of your audience in order to teach them something. And while this may be true in some cases, I’d much rather learn from someone who REALLY knows what they’re talking about!! If any of these ring true for you, an online course may be the right move for you! If you don’t already have an audience, it can be difficult to know if there’s ACTUALLY a demand for your course topic. But all is not lost – there’s one surefire way to find out not only IF there’s demand, but if there’s TOO MUCH demand! (You don’t want to create a course if there are already a bunch out there!). Udemy, one of the top online course creation sites, offers a tool for course creators to see how much demand there is for a topic. Simply sign up for free to become an Udemy instructor, then go to the Instructor Dashboard. Click on Marketplace Insights, and then type in the topic you’d like to teach. Udemy will then tell you a) whether this is a good topic, b) how much demand there is for it, and even c) how much money you can potentially make if you create a course on this topic*. *This number is an estimate, and in my experience is usually way off. This tool is best used to determine demand for your topic, not the estimated revenue you can make! Some people have this idea that a course sells itself. Nothing could be further from the truth! If you host your course on a platform like Udemy or Lynda, they may promote the course for you a little bit. But generally speaking, the lion’s share of the promotion will be up to you. For some DIY marketing tips for your course (or anything else), check out my post 21 Marketing Activities You Can Do in an Hour or Less. Creating an online course is no joke. And this doesn’t include any of the marketing or promotion! Before you start, make sure you’re prepared to put in at least a few weeks of full-time work to create your course…if not more. Before you launch your own course, I highly recommend taking an online course yourself. This will give you a better understanding of what a course looks like, what you like/don’t like in a course, and what all is involved in creating one. Better yet, take a competitor’s course to see what you’re up against. This will also help you fill in any knowledge gaps that will make YOUR course even more valuable! Check out Udemy to find pretty much any type of course you can think of – from pilates to marketing to piano to web development…and courses cost as little as 10 bucks! Are you already selling digital products or coaching/consulting services? If so, there’s a good chance people will also be willing to pay for your online course. In fact, creating an online course can be a GREAT way to move from a one-to-one to one-to-many model; so, instead of trading your time for money, you create your course once, then sell it again and again! While this isn’t a necessity by any means, it certainly does help. If you’ve taught a course, workshop or even presented in front of an audience before, this will give you an advantage as you create your own course. It will give you a better understanding of how to speak to your audience, what type of information they’re looking for, and how to structure your content…all of which can be a major bonus when designing and delivering your course. Are people constantly asking for your help, advice and guidance? Even if you’re not currently charging for this advice, this can be a good indicator that there’s a market for your course. Instead of always giving away your advice for free, why not direct people to your course? This will save you time, and will provide more value to all those people asking for your advice – although they WILL have to get used to paying for it! So…are you ready to start an online course? Or have you figured out you need to get some things in order before you launch? I’d love to hear from you: What’s your next step? If you’re ready to create your course, what’s it going to be about? Share below! In my thoughts we have to learn and expertise in our field by implementing practically then we can credible to make an online course…Also we have to make a small audience base for sell our course. By the way thanks for your amazing article.? I thought that at fast I will learn it practically after that I will try.But after reading your article article I have got to take my final decision.So,you are a great article writer. This is a useful article. It provides me with great information. “Thanks! It’s a big help! Yes! your information regarding the online course is really amazing. I would like to create an online course but will keep in mind the above-mentioned tips. Hello Kim. These are some great tips. It is a shame that there are many of us out there that think that creating an online course is easy peasy. I realize that this is not true at all. Heck I remember trying to create my first eBook back in the day and that took me at least a week or more just do a simple 36 page book that was double spaced. lol. It’s a great spot to find new information. I will bookmark this page for future reference. Thank you so much for this wonderful article.